Build it and maybe they will serve it. 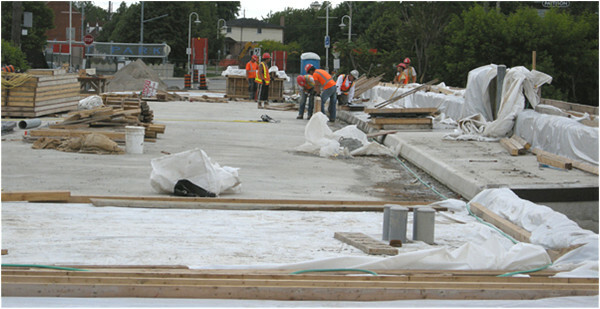 Work advances rapidly on the ramp down to the GO parking lot which will extend westward from James GO station along the rail right of way. A handsome bit of Pan Am infrastructure with a promising but uncertain future. 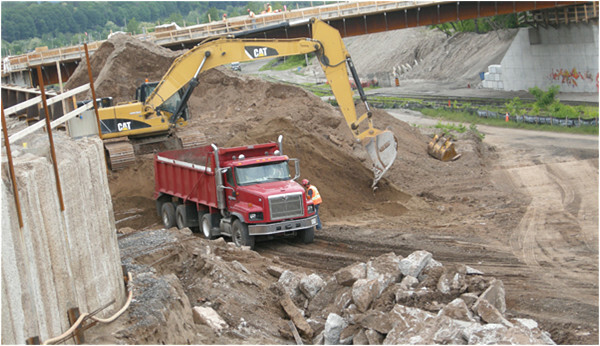 Problems doubled the construction time on this bridge replacement job, but the end is near. The North End bubble continues to expand and is now inducing demolitions. Twenty nine properties changed hands in the area bounded by Wellington, the CN main line and the water between January and the end of May, and June looks very busy also. There were three tear downs last year, of one story wood frames. 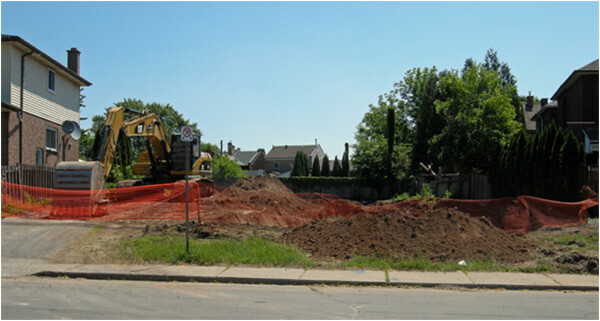 But this Bay Street demolition - to make way for a small condo project - was of a large brick house. Clearly this degree and rate of change is going to be dislocating (literally) for some. So far we hear lots of cheerleading from the realtors and not much from anyone else. Social Planning and Research Council, what's happening? Placing concrete at part one of an extremely robust three story building kitty-corner from the still surviving Tivoli on James North. 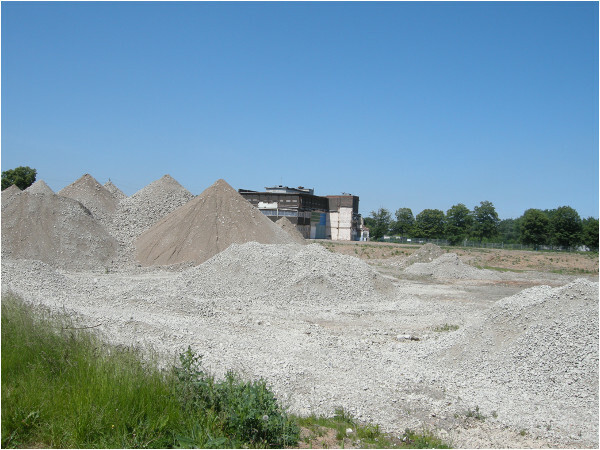 Two large blocks of the twentieth century industrial base have been pulverized to make way for new trades shops. The good news: a surface parking lot is being replaced with a structure. 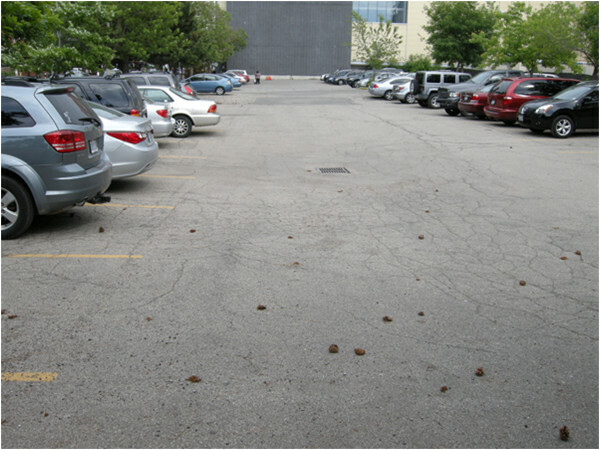 The bad news: a surface parking lot is being replaced with a structure. Continued iatrogenic necrosis of the surrounding area is anticipated. On the heritage front, historic asphalt continues to weather nicely at the David Braley Memorial Parking Amenity and Kiosk. Observers will recall that the lot was threatened by the continuing existence of the Board of Education building, which has since been removed. The site is now occupied by a large pile of public debt. Where is the large pile of public debt? Hopefully it didn't go down the drain in the photo. Or to the Society for the Preservation of Endangered and Essential Downtown Surface Parking Lots. I'm originally from Vancouver, and a BC Lions fan. I know who Braley is. I suppose i was being a little too cheeky with my comment ... count me as unimpressed with the naming of things after business tycoons or corporate sponsors. I'm originally from Vancouver, and a BC Lions fan. I know. Does being a Canucks fan make it worse? No, that is understandable. Being from one CFL city and changing allegiances would be bad. The only thing worse is being a leafs fan. There is no good reason for that whatsoever. "funny" story. we live in corktown. big pass through area in the a.m for mountain commuters trying to reach the core or the highway and beyond. for over two years our streets have been pulled up to accommodate to expansion of the water works pump station at the top of ferguson. the sole purpose of the expansion is to allow current and future residents of the mountain to flush their toilets and get water from their taps. the mountain people i work with are livid, livid! about the delays and detours to their commute. 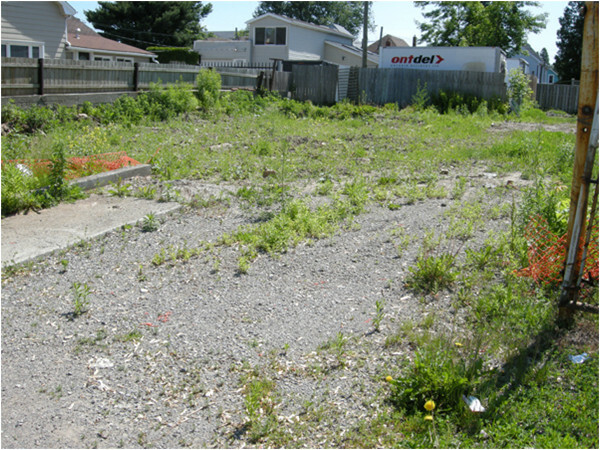 its our neighbourhood being razes and re-razed every year. corktowners have had to deal with flooding, wrecked foundations, loss of green space and recreation areas, torn up front yards, loss of parking, heavy equipment at 7 am, all to build a pump station for existing and future sprawl on the mountain. then the mountaineers i work with complain like its our fault they spent an extra ten minutes in the cars they love so much! we arent even getting upgrades to our sewer or water services! the upgrades are to the trunk. head shakingly mind numbingly true. Highland Rez park same thing. Further west along the escarpment they did the same thing a few years back. While other cities make new developments maintain and house their own storm-water, here we just dump it all into the lower city so residents below can enjoy the annual tradition of bailing out their basements and paying skyrocketing insurance. Oh and don't forget we all got to chip in to pay for the Red Hill and Linc so that trucks could be removed from downtown and our streets calmed. Lucky us, we got to pay AND keep the 5-lane truck freeways. That's cool. I live in Corktown too, right near the pumping station. Construction's been wrapped for about a year now in the area, if memory serves. Right now the only construction in the area I'm aware of is the side streets surrounding the park. I am moving up the mountain shortly, so it's good to know I won't have any water flow issues. 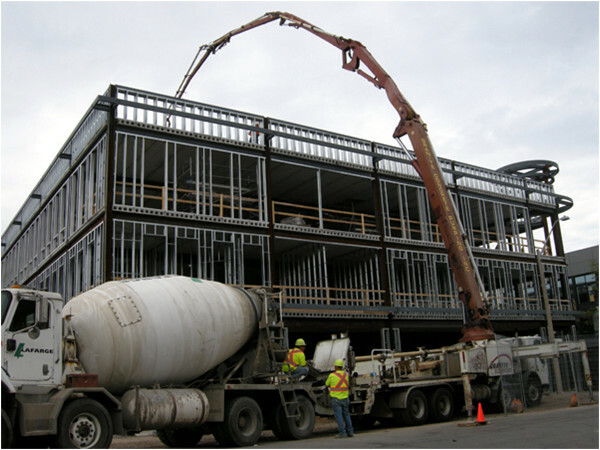 The brunt of the construction was 2010-2012/13. We've got pretty solid streets right now, although some of the side streets have had some serious sinkhole issues lately (Augusta, Catherine, etc) but the work done in 2010+ has given the majors pretty good surfaces. Still battling a lot of unnecessary traffic at John/Charlton, James/Charlton and up/down the Jolley cut though. ferguson has been and continues to be a mess, from the hill down to the tunnel. aurora too. The Ferguson pumping station primarily is for the Lower City/west end, pumping water to areas between Corktown and Dundas, and parts of the West Mountain.